N-Palmitoylethanolamide (PEA), an endocannabinoid-like molecule, participates in controlling behaviors associated with mental disorders as an endogenous neuroprotective factor. On the basis of accumulating evidence and our previous data, we tested the hypothesis that the antidepressant-like effects of PEA observed during chronic unpredictable mild stress (CUMS) are mediated by possible targets in the peroxisome proliferator–activated receptor alpha (PPARα) pathway. In this study, rats were subjected to 35 days of CUMS and treated with drugs such as PEA (2.5, 5.0, or 10 mg/kg, by mouth), fluoxetine (10 mg/kg, by mouth), or the combination of PEA and MK886 (1-[(4-chlorophenyl) methyl]-3-[(1,1-dimethylethyl) thio]-α,α-dimethyl-5-(1-methylethyl)-1H-indole-2-propanoic acid). After behavioral tests, the animals were sacrificed and their hippocampi were dissected for subsequent studies. PEA normalized weight gain, sucrose preferences, locomotor activity in an open-field test, and levels of the PPARα mRNA and protein in the hippocampus, and it reduced serum adrenocorticotropic hormone (ACTH) and corticosterone (CORT) levels in rats subjected to CUMS. 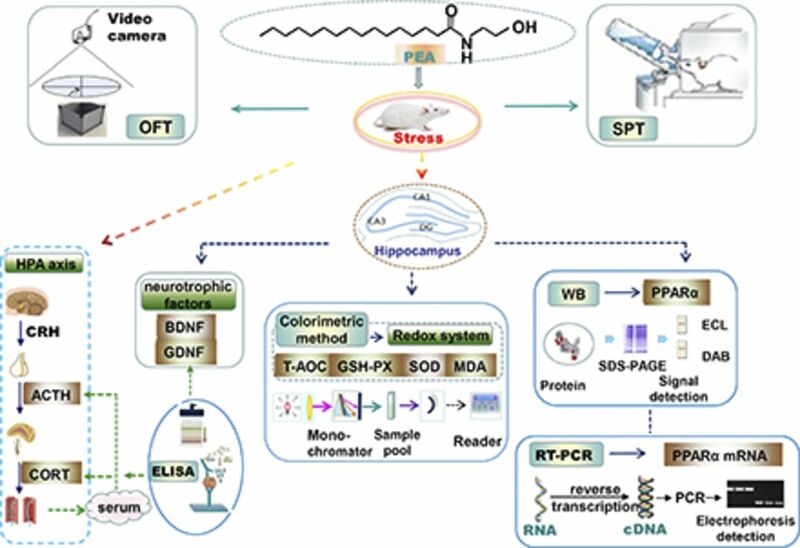 PEA reversed the abnormal levels of several oxidative stress biomarkers and increased the concentrations of two neurotrophic factors in the hippocampus of CUMS-induced rats. In addition, PEA alleviated the decrease in hippocampal weight. However, the aforementioned effects of PEA were completely or partially abolished by MK886, a selective PPARα antagonist. On the basis of these findings, the PPARα pathway in the hippocampus is a possible target of the antidepressant effects of PEA, and the maintenance of a stable hypothalamic-pituitary-adrenal axis, the antioxidant defenses, and normalization of neurotrophic factor levels in the hippocampus are involved in this process. This work was supported by the National Natural Science Foundation of China (Grant 81460217 and 81760650). The authors declare that there are no conflicts of interest relating to these studies.